JORDAN, Thomas (1819-1895) was a Confederate general and major operative in the network of Confederate spies during the American Civil War. A career soldier in the armies of three nations, he had previously fought in the Mexican–American War, and in 1868 was appointed as chief of staff of the Cuban insurgent army, which fought to achieve independence from Spain. War-date Letter Signed “Thomas Jordan” on Head Quarters 1st Corps Army of the Potomac lettersheet, Fairfax Court House, October 14, 1861, addressed to Brigadier General Clark and reads in part: “...An officer attached to the Regular Garrison of the entrenced Camp, Capt. G.V. Moody, has been communicating directly with the Head Quarters of the Army of the Potomac. The General directs that he shall be instructed in the rule of the service touching official communications, and further that Capt. 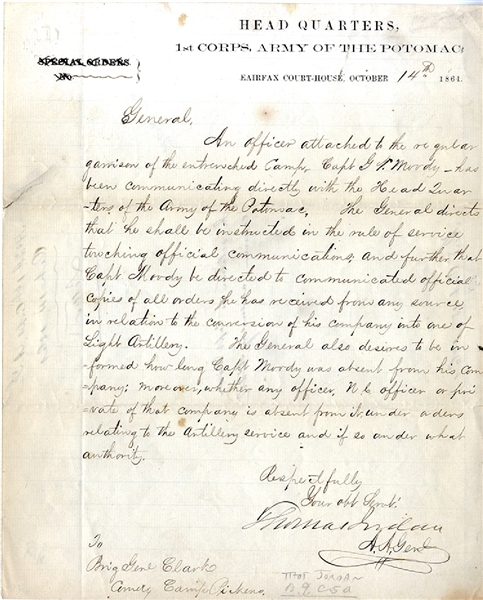 Moody be directed to communicated official copies of all orders he has received from any sourced in relation to the conversion of his company into one of Light Artillery...” Fine condition.